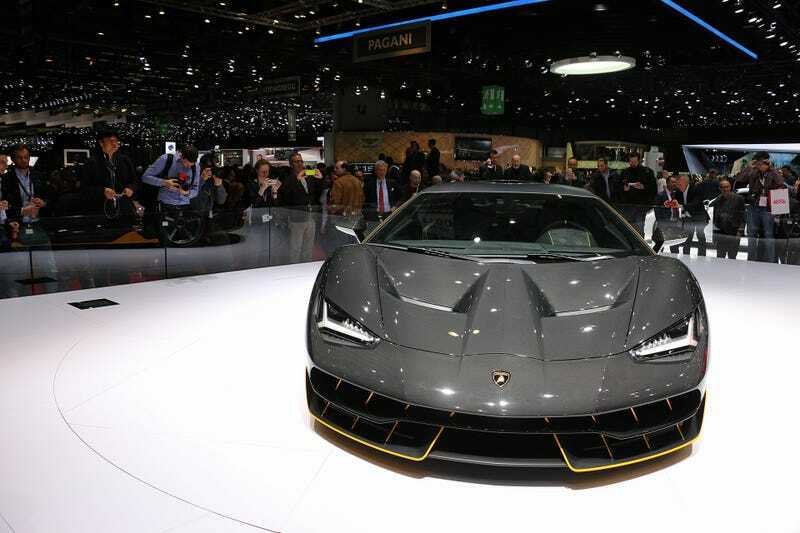 The Lamborghini Centenario is great. For starters, it’s got a 770 horsepower naturally aspirated V12. It’s also telling us that the Aventador’s successor will have four-wheel steering, and while Ferruccio Lamborghini would never care for its design, it’s actually the perfect tribute to Stephan Winkelmann’s triumphant 11 years at Sant’Agata. Ferruccio Lamborghini would have been 100 years old on the 22nd of February, just a week before the start of the Geneva Motor Show. This gave Lamborghini a great opportunity to come up with another Aventador-based special edition, and that’s something they seem to like doing not only to wow the crowd and show Horacio Pagani at the next stand that they’ve still got it, but also because selling 20 coupes and 20 roadsters for many millions of dollars each isn’t half bad for business. Think Veneno. While the Centenario has much cleaner lines than Lambo’s previous spaceship, it’s still far from being anything Ferruccio Lamborghini would approve of. And not just because the show car’s yellow accents are bordering on vulgarity. Ferruccio Lamborghini wasn’t a huge fan of radical shapes. While the Miura’s curves and advanced engineering managed to get the green light from him, a few years back, Lamborghini’s first car, the 1963 350 GTV by Scaglione, remained a one-off because the boss wasn’t impressed by all those fantastic angles and commissioned Carrozzeria Touring instead to fix the car before it could go into production. Today’s V12 Lamborghinis originate from the Countach, not the Miura. That’s no big deal apart from the fact that Ferruccio Lamborghini sold his company by the time they came out with the Countach LP400, and therefore has very little connection with anything mid-engined past 1971's LP500 prototype. The Countach was the child he had to give up for adoption. I read Top Gear’s ‘Big Interview’ with Winkelmann made after they announced his move to Audi, and his two favorite special Lamborghini projects happen to be my two favorites as well. We took it to the U.S in August 2007 and pre-sold all the cars based on a scale model. It helped us recognize the potential of the brand without knowing it at that time. Personally, I like it because it was done in a very charming way. They simply put all the Murciélago engines that produced more power on the dyno to the side, gave the flagship an all new carbon fiber body and a bonkers fighter jet interior, jammed those 650 HP V12s in the middle, and called it a day, asking $1.5 million for each in 2007. The SVs and those early Murcielégos are both great, but the Reventón is the slightly mad uncle everybody loves to hang out with. We didn’t build these cars for the museum or a private racetrack, but to go on public roads, and this was something which was not possible in the Sesto Elemento because of homologation. But even now, four or five years afterwards, we’re still getting requests for the Sesto Elemento. Five years on, Winkelmann is leaving the company before Lamborghini’s third model, the 2018 Urus SUV could hit the street. And he isn’t the only one. Filippo Perini, Lamborghini’s Chief of Design is also gone, having moved on to head Italdesign. His successor is Mitja Borkert, who’s been working in Porsche’s design department since 1999. What will Lamborghini do next apart from launching the world’s most extreme SUV and building a new V12 supercar with four-wheel steering, 800+ horsepower and Apple CarPlay? And how will their cars look after the company is run by an ex-Ferrari guy and its products get influenced by a Porsche veteran? They will make a fast car you won’t mistake for anything else. For sure. And you shouldn’t worry about Ferruccio’s well-deserved tribute car either. It is called the Asterion, and it came two years early. It’s exactly the sort of car Lamborghini’s founder had in mind when deciding to show Enzo Ferrari how it’s done. There’s nothing wrong with Winkelmann getting a 770 HP tribute, and this naked carbon Centenario certainly feels like a fitting farewell to the man who made Lamborghini the powerhouse it is today without letting parent company Audi take away too much, if any from the Italian’s traditional lunacy. On his first day at Audi, he should be smiling, thinking that his most cherished project, the Aventador will be able to keep up with beefed up Quattros all day long for quite some time. It’s not a bad car to have on your CV.